What Is Your Favorite Garden Tool? Q: What is your favorite garden tool? A: Everyone has a favorite tool, but often the favorite is the one that's right for the specific job. Here are a few of our suggestions. 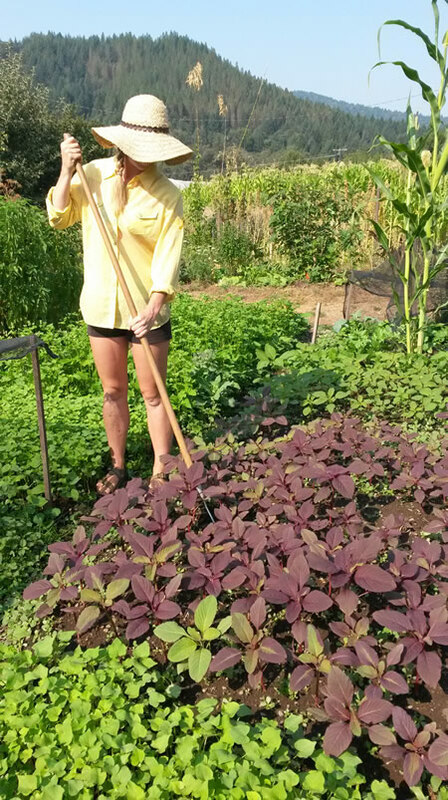 The collinear hoe (and my personal favorite, pictured above) was developed by famed intensive gardener Eliot Coleman. This tool is a sharp, small-headed hoe used while standing. This is a great change of pace from frequent bending. It is available with a 3.75 or 7-inch head so you can choose the tool that fits your plant spacing. I use the small head frequently as it allows for delicate and careful weeding. It is most effective when I use it as new weeds are just sprouting. I scrape the surface with the hoe, skip watering for a day and am able to eliminate a majority of the oncoming weeds without impacting my transplanted crops. 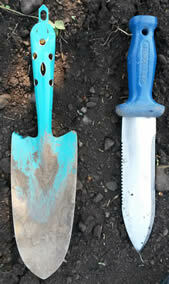 Farm staff agrees it's best to match the size of the tool to the size of the roots you are transplanting. 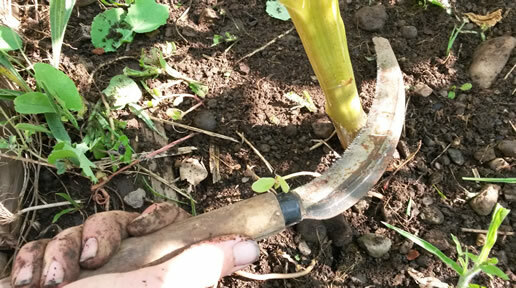 Small thin roots transplant easily with a small thin trowel like a Hori-Hori—a Japanese farming tool that looks like a big knife. This tool has sharp sides for easy entry into the soil and a flat blade that minimizes compaction when transplanting quickly. If you are dealing with broader, branching roots, my coworker, Justin, loves a hand trowel. This tool can remove as much soil from the transplanting hole as needed to clear the way for more-sizable roots to be transplanted straight, resulting in optimum plant growth and health. Garden manager, Jes, prefers the offset style of the handle because she feels it is easier on her wrist. When it comes to harvesting it is hard to beat the serrated Japanese sickle. This is a go-to tool for all of our managers and staff. The serrated edge and curved blade make it ideal for cleanly cutting grains, like wheat and rye, at the base. Used to clear compost crops, this workhorse can cut through a lot of material without getting dull. I even use my sickle to cleanly harvest zucchini without damaging the plant.